Visit to India of His Excellency The Most Rev. 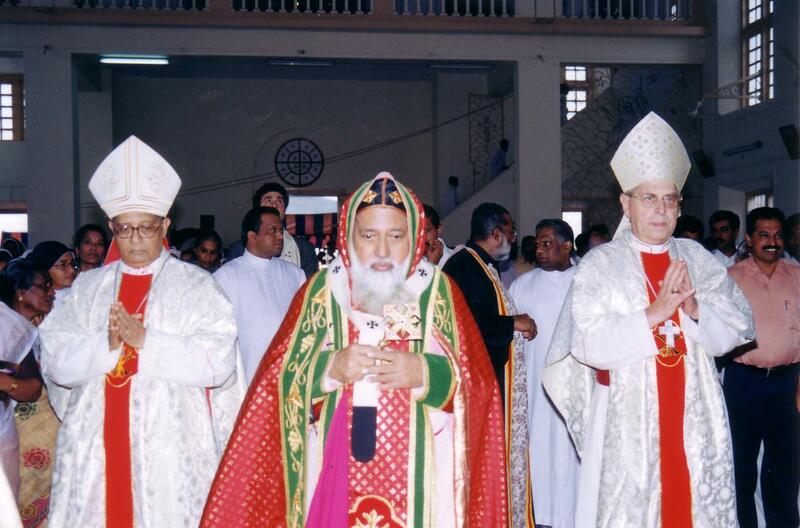 Antonio Maria Vegliò, Secretary of the Congregation for the Oriental Churches, On the occasion of the 25th anniversary of the Episcopal Consecration of His Grace Cyril Mar Baselios Malancharuvil, Metropolitan Archbishop of Trivandrum and Head of the Syro-Malankara Church His Excellency The Most Rev. Antonio Maria Vegliò, Secretary of the Congregation for the Oriental Churches, attended the recent celebrations of the 25th anniversary of the episcopal consecration of His Grace Cyril Mar Baselios Malancharuvil, Metropolitan Archbishop of Trivandrum and Head of the Syro-Malankara Church. The Syro-Malankara Catholic community had very much desired to have a representative of the Holy See in attendance on this important occasion. The presence of the Archbishop from Rome was at the same time a recognition that this Church and its Head and Pastor, the honored Mar Baselios, had rendered most admirable service, on the vast Indian sub-continent as well as in many parts of the world where Syro-Malankara faithful now live, to the Gospel of Christ. The Syro-Malankara Church Together with its close spiritual relative, the Syro-Malabar Church, the Syro-Malankara Church dates back to the preaching of St. Thomas the Apostle, and in the 4th century came into contact with the Chaldean Churches of Mesopotamia. From these the Thomas Christians of India, as they have been called from earliest times, adopted their liturgical traditions while maintaining their own administrative autonomy and ecclesial identity. All through the centuries the Church in India remained connected in various ways with Rome, and when the Portuguese missionaries arrived in India in the 16th century, they were greeted by the Malabarians as "fellow Christians and representatives of the ancient See of Rome". But, fearing that the Latin presence would threaten their oriental heritage and identity, thousands of St. Thomas Christians established relations with the Syrian Orthodox Patriarch of Antioch. These were the beginnings of the Malankara Orthodox Church of India. Until the 20th century repeated formal attempts on both sides at reconciliation met with little success. Finally, in 1926 a group of Malankara Orthodox Syrian bishops, who were opposed to the jurisdiction of the Orthodox Patriarch in India, began negotiations with Rome under the leadership of Geevarghese Mar Ivanios. In 1930 two bishops and a small group of faithful rejoined the "Catholic Communion" and in 1932 Mar Ivanios made his official visit to the Holy See of Rome, where Pope Pius XI invested him with the sacred pallium. In the same year the Roman Pontiff established the Syro-Malankara Catholic Hierarchy consisting of the eparchies of Trivandrum and Tiruvalla. Later, more Malankara Orthodox prelates followed and prompted a significant movement of faithful into the new Syro-Malankara Catholic Church, which by 1950 counted some 65,000 faithful, in 1960 over 100,000 and in 1970 almost twice that number. Since then the Syro-Malankara Church, which is named after one of the earliest Christian settlements in Malayankara near Cranganore on the Malabar coast, has grown in a most remarkable way. Presently, the Church counts around 400,000 faithful worldwide, most of whom reside in the five Syro-Malankara eparchies of Trivandrum, Tiruvalla, Bathery, Marthandom and Muvattupuzha, covering Kerala State and parts of Karnatake and Tamil Nadu. Over 6200 Syro-Malankara families live in other parts of India where spiritual, catechetical and sacramental services are provided in their own rite in cooperation with local Latin rite bishops and priests. Many more faithful emigrated and receive pastoral care in Syro-Malankara mission centers such as in the United States (about 300 families), in Canada (nearly 40 families), in Germany (about 300 families) and in the Gulf States. The remarkable vitality of the Church is most clearly seen in the enormous number of vocations to the priesthood and to the religious life. A total of about 600 priests, eparchial and religious, are presently serving the needs of the Syro-Malankara population, and the number of seminarians in minor and major seminaries for Eparchies and different religious Congregations amounts to an impressive total of close to 500. In addition, nearly 2000 sisters in about 16 different religious institutes represent an extraordinary resource of spiritual wealth and apostolic activity. The Syro-Malankara Church can lay claim to operating about 480 charitable agencies and almost as many educational institutions. Mar Baselios, Metropolitan of Trivandrum The tremendous vitality of this oriental Church needs to be in part attributed to the spiritual leadership of Mar Baselios, who was appointed in 1995 to the Metropolitan See of Trivandrum after serving as Bishop of Bathery from 1978. Born on August 16, 1935, in Kerala, Mar Baselios entered the "Order of the Imitation of Christ" (O.I.C.) in 1951. He was ordained a priest in 1960, received a licentiate in Philosophy and Theology from the Pontifical Athenaeum in Pune, India, and a doctorate in Canon Law from the Pontifical Gregorian University in Rome. He became professor of Dogmatic Theology at St. Thomas Apostolic Seminary in Kottayam and at the Pontifical Institute of Theology and Philosophy in Alwaye, and served as Superior General of his religious Congregation. In 1996 he was elected Chairman of the Kerala Catholic Bishops' Conference, and in 1998 President of the Catholic Bishops' Conference of India (C.B.C.I.). The visit in Kerala of the Archbishop Secretary As His Excellency The Most Rev. Vegliò arrived in Trivandrum on Friday afternoon October 24th, after a brief stopover in Bombay and a visit to the Syro-Malabar Eparchy of Kalyan, he was received with great joy and respect, according to local traditions, by Mar Baselios and representatives of the Archeparchy. The festivities began at about 8:00 a.m. on Saturday October 25th with a spectacular reception on the grounds of St. Mary's Cathedral in the presence of thousands of faithful. Mar Baselios was the main celebrant of the Holy Qurbano, the Divine Liturgy of the Syro-Malankara Rite, which was concelebrated by about 20 bishops of all rites, Latin, Syro-Malabar and Syro-Malankara, and a large number of priests. The congratulatory letter, which the Holy Father had addressed to the honoree, was read in malayalam, the local language of Kerala, and was greeted with warm applause. Song and ceremony of the liturgy on this joyous occasion conveyed, not only the sense of the divine presence, but also a sense of the deep-felt gratitude of those present for the person, life, and loving commitment of their Head and Father, Mar Baselios. Following the Divine Liturgy, a public reception was held for the honoree across from the Cathedral in St. Mary's Auditorium. The congratulatory message of His Beatitude Ignace Cardinal Moussa I Daoud, Prefect of the Congregation for the Oriental Churches, was read, followed by the Inaugural Address delivered by Archbishop Vegliò. Also in attendance, among the many prelates of the Church, were His Eminence Ivan Cardinal Dias, Archbishop of Bombay, Their Excellencies Mar Joseph Powathil, Syro-Malabar Archbishop of Changanacherry, Most Rev. Vincent M. Concessao, Archbishop of Delhi and Vice-President of C.B.C.I., Most Rev. Soosa Pakiam, Latin Bishop of Trivandrum and homilist at the Divine Liturgy, and Joshua Mar Ignathios, Syro-Malankara Auxiliary Bishop of Trivandrum. Mar Baselios' impact also on many areas of civil society was made evident by the presence of various Ministers from the State and the Federal Government of India, all of whom expressed their best wishes and their gratitude for the contribution Mar Baselios had made, especially in the areas of education and inter-religious dialogue. In fact, education and inter-religious dialogue were the focus of his words of thanks addressed to all present. For the remainder of his time in Trivandrum, Sunday Oct. 26th and Monday Oct. 27th, Archbishop Vegliò was invited to visit seminaries, schools, convents and mission centers of the Archeparchy: he celebrated a Latin rite Liturgy for the close to 70 seminarians of St. Aloysius Minor Seminary; he was shown a hospice for the poor and the sick and encountered the patients of a nearby leprosarium; he visited St. Mary's High School, a complex of several buildings, housing a total of 12,000 mostly Hindu students (the largest of its kind in southern Asia and recognized for its quality education); he was given a private tour of the impressive campus of Mar Ivanios College at Trivandrum, an area of 100 hectares accommodating high schools, colleges for engineering and technology, for English and education, for economy, arts and sciences, with an enrolment of well over 3,000 students of whom only about 5% profess the Catholic faith; and he blessed, together with Mar Baselios, a new Marian shrine located near a major highway outside the city. One of the unexpected occasions was the visit to the mission center at Chemboor at quite some distance from Trivandrum, where faithful from 103 mission stations of the area had gathered (an area with about 75,000 Syro-Malankara Catholics). Introducing the visitor as co-worker with the Holy Father at the Congregation for the Oriental Churches, Mar Baselios, in his address to those present, spoke again of the need for education for all sections of the community. Education has truly been one of the priorities of his episcopal ministry, which includes the founding of well over 40 academic institutions. The concluding item on the agenda was reserved for a visit to the Archeparchial Major Seminary of St. Mary, Mother of the Church, with close to 200 seminarians and their educators. Present for this occasion were also Officials of the eparchial Curia and Superiors of religious Congregations. Archbishop Vegliò invited Mar Baselios and those present to join him in thanking God for so much good accomplished in the Syro-Malankara Church today, and upon it he invoked God's many blessings for a most promising future. After praising the Syro-Malankara community for its fidelity to the Holy Father and to the Universal Church, he called upon the faithful to "trust in God's love", as the episcopal motto of Mar Baselios suggests. Together with Rev. Norbert Glasmacher, Official at the Congregation, who accompanied him, Archbishop Vegliò acknowledged with gratitude the unique gift of his first ever visit to the Syro-Malankara Church.